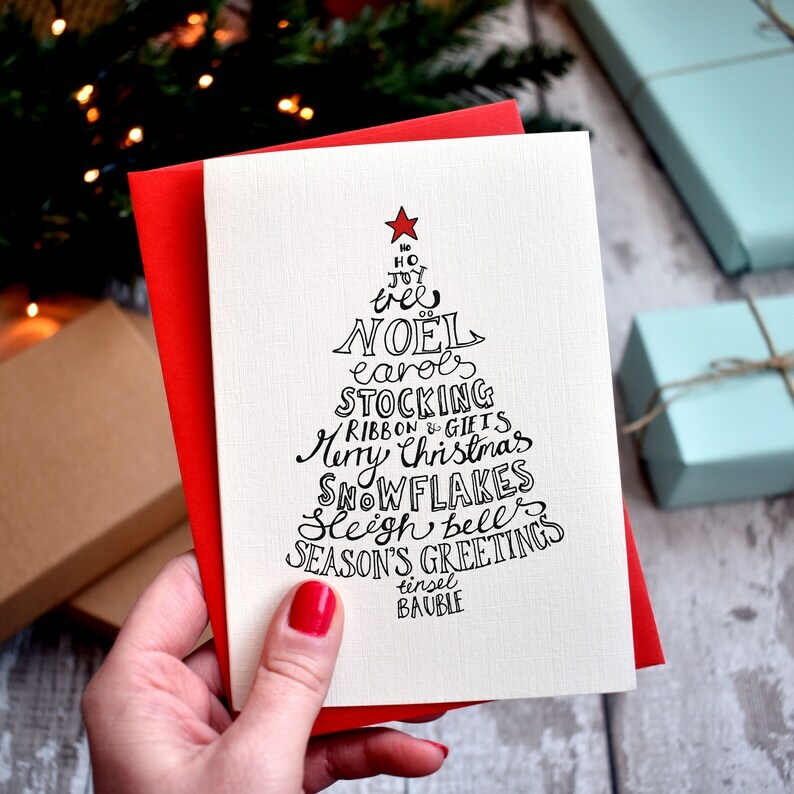 These beautiful traditional hand-lettered Christmas cards come in five different designs, each featuring a classic Christmas shape, complemented by a luxury red envelope. 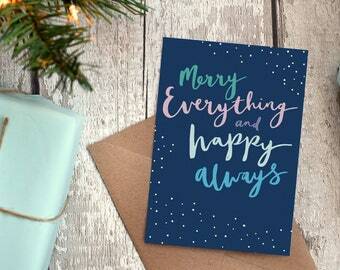 These cute cards are perfect for writing holiday messages to friends and family. 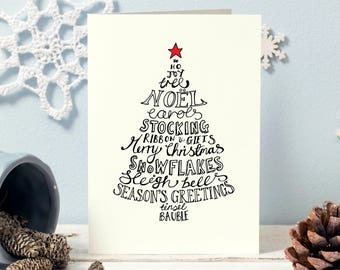 Each original hand-lettered typographic design with festive words and phrases, digitally printed onto a quality ivory linen card and hand-folded. • A6 size (105mm x 148mm / approx. 4"x6") when folded. 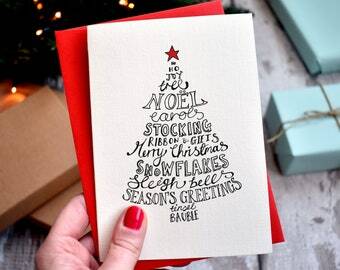 • Blank inside for you to write your own personal Christmas greeting! 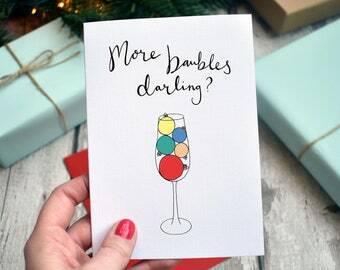 Champagne & Prosecco lovers Christmas card | More baubles darling? 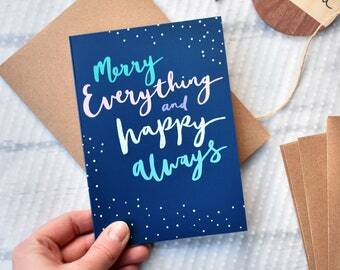 Beautiful cards on high quality paper - fountain pens write very nicely. Lovely, friendly service and quick delivery. Card payments and Paypal accepted. Please note that once an item has been dispatched I cannot cancel the order. However, if it is a non-customised item you may return the product unopened and intact within 14 days of delivery to receive a full refund. 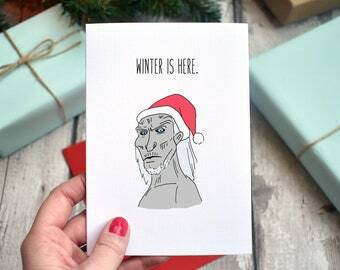 If you have ordered a personalised item this cannot be returned unfortunately unless faulty or damaged, in which case a replacement will be sent. 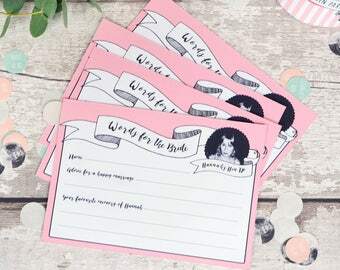 Payment for ready-to-go wedding stationery designs will be via a custom listing to be paid before I begin work on your order. 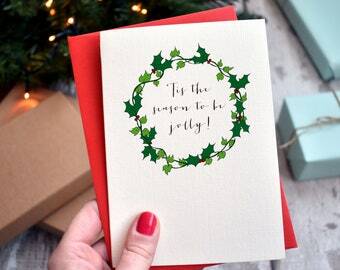 If you are ordering a bespoke design I require a deposit initially to hold a 'production slot' for the custom work. I will then deduct the deposit from the total cost when the bespoke design has been approved. Custom made and personalised items are non-refundable unless faulty or damaged. If the items are faulty or damaged please return them to me and I will replace the item or offer you a refund of the items value and the original postal costs. Other items which are not personalised/customised need to be returned within 2 weeks of purchase to receive a full refund of the items value and original postal costs. PLEASE NOTE - Guaranteed next day 1pm only applies to items posted Mon-Fri, items posted on a Saturday should arrive the following Monday unless a Bank Holiday. PLEASE ALLOW FOR PROCESSING TIME, items will not necessarily arrive the next day after ordering, instead they will arrive the next day after dispatch/processing time. Prints and flat paper goods will be packed in reinforced 'do not bend' envelopes to protect their contents. Custom orders are non-refundable unless damaged or faulty I would be happy to replace or exchange the item for you once you have returned the original damaged/faulty item. If there's anything you want to know that's not answered here please send me a message via Etsy conversations and I will get back to you ASAP! 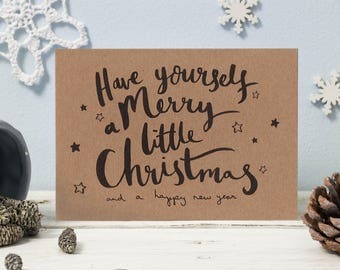 Funny Reindeer Christmas cards | Let's Raise the Hoof! 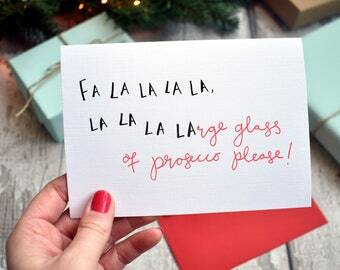 Funny Prosecco Christmas Card | Fa la la LArge glass of prosecco please!